I am loving doing the Inktober challenge! Still playing with Derwent Inktense blocks. Night and day for the last couple of weeks, I have been weaving up a storm, finishing Part 3 of Rebecca Mezoff’s online tapestry workshop. 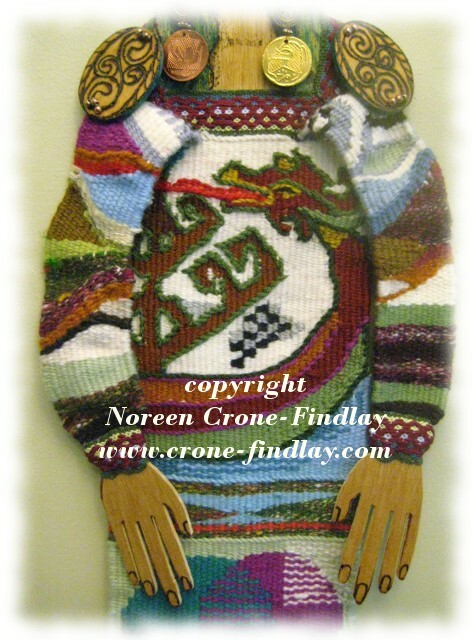 The dragon ship on her chest is based on images in the Bayeux tapestries, and the tree of life is based on a fragment of the Overhogdal tapestry fragments that I saw in the Viking exhibition at the Royal British Columbia Museum in Victoria, BC in July. The Overhogdal tapestry was woven with a linen background, with the figures outlined in soumak and the colors filled in with colored weft in a kind of brocade technique. The imagery in these tapestries is just so marvelous that I find them really inspiring and love sketching elements from them. 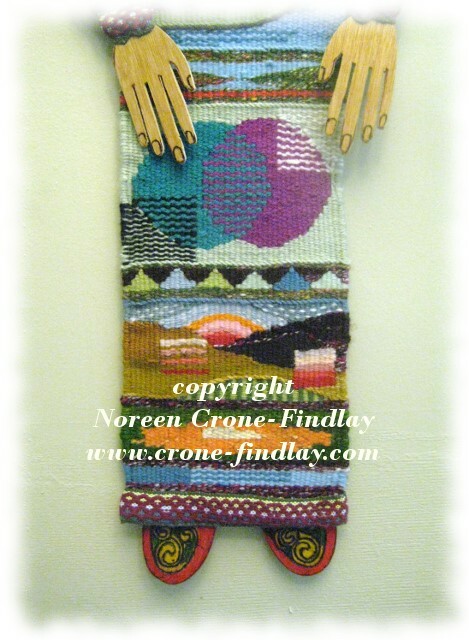 For her head dress, bodice construction, cuffs and hem, I used narrow bands that I wove on my double slotted Swedish rigid heddle loom. Her head, hands, shoulder medalions, and feet are plywood. I drew, cut out and burned and painted all the wooden elements. 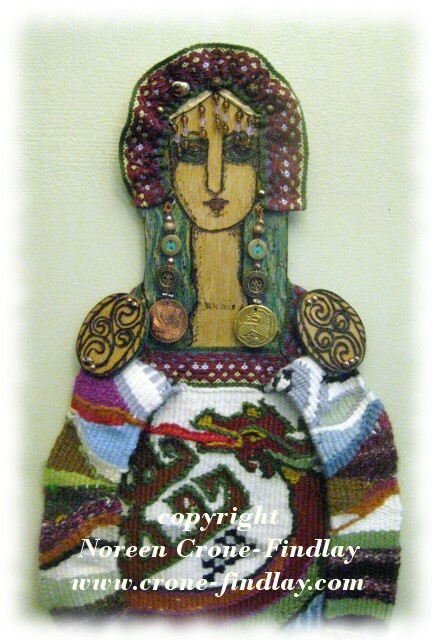 Her earrings are made from beads, vintage buttons and reproductions of Viking coins that I bought in the Museum gift shop. 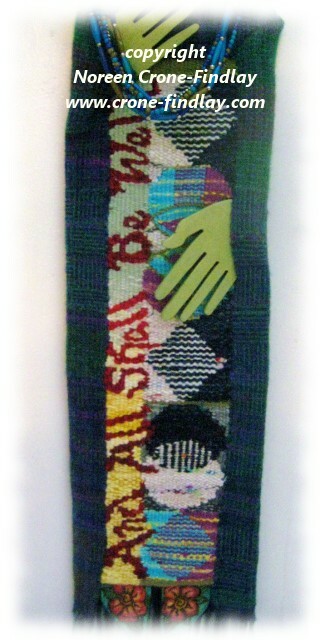 ‘Asking for Miracles’ was woven on my 16 inch Mirrix tapestry loom and is about 36 inches tall. you know, the wars, the devastations that are being wrought on so many levels and in so many ways on our precious little planet. 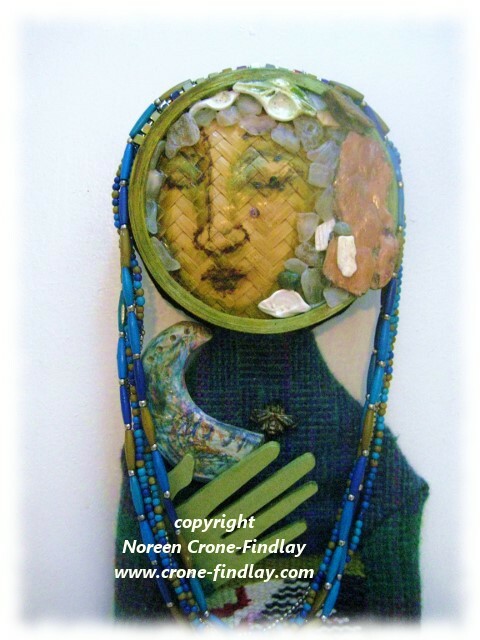 As I weave, I often meditate on sending out peaceful, healing energy…. the stuff that miracles are made of, after all, so to be honest, I think that when I am doing this, I am asking for miracles…..
and may your life be full of miracles of healing, wholeness, wonderfulness in every way!